I've never realized how much I love gluten. It's in basically everything I eat and bake (pasta is a separate food group of mine), so when I went looking for a recipe for something actually good and free of gluten, I was a little upset. But then I found a recipe and figured I'd try it. They're called Chocolate Puddle Cookies, and I can't even imagine a more appropriate name. 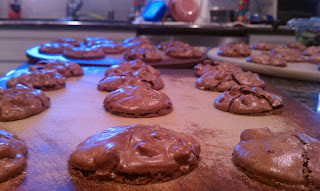 They are so moist and chocolaty and dense that it was like a little chocolate puddle of goodness. 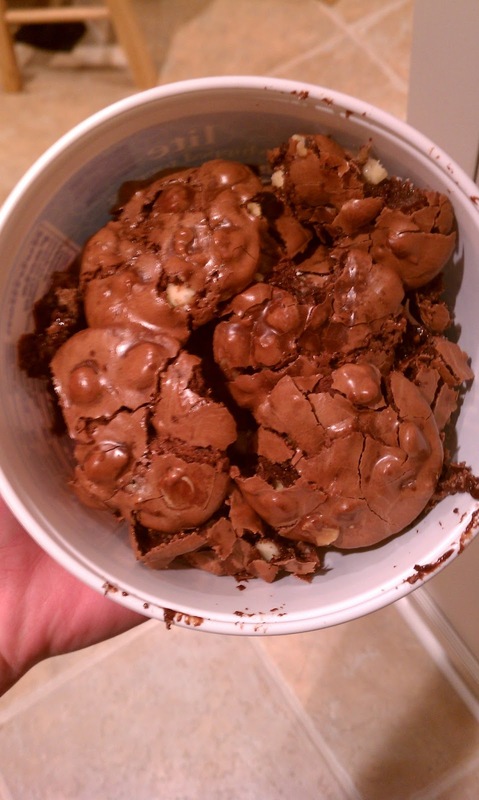 I made them for a gluten-intolerant friend who's birthday was coming up and almost didn't bring them to her because I was afraid they were bad-tasting. I had left them out on the counter and when I couldn't get them off the stone but had to leave, I was quite frustrated that they were so sticky and not fully 'cooked'. But when I came home, half of them were gone! My mom asked me what were in them because they were "so freaking good", as she put it. I chuckled, knowing they were only about 70 calories (!!!!!!!!) and put the rest in a platter. 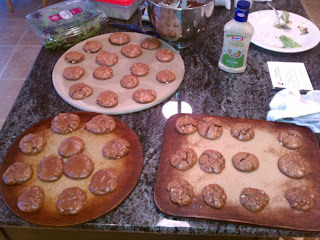 My friend, and her gluten-intolerant friend, absolutely loved them... they couldn't believe they were gluten-free. So these little cookies/brownies/mess of a dessert are one of my favorite things. I have yet to try them again, but I'm proud of them! And you can do all the math yourself, but I figured (if you make 38 cookies) each cookie to be about 67 calories, 1g fat, 15g carbs, and 13g sugar. It's a lot of sugar per cookie, but I'd say you have to include that much to make them good. One thing you'll want to note is that I used a stone, so I didn't grease it. 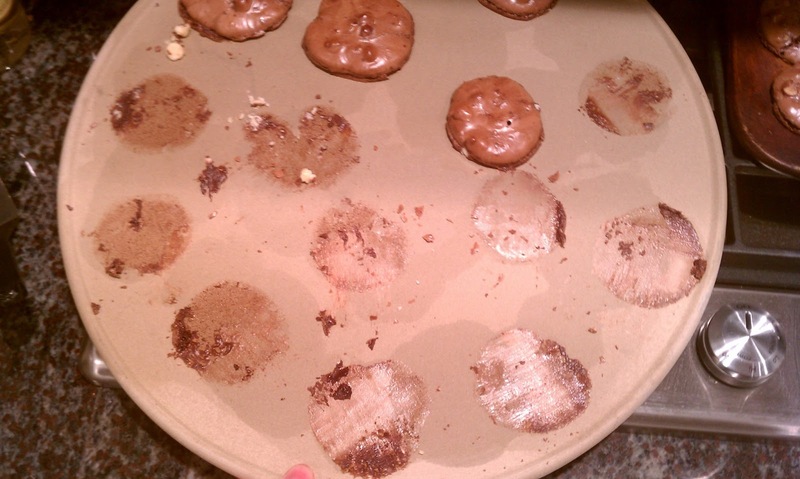 It was nearly impossible to get them off the pan because the inside was so sticky and the outsides were so tough. The cookies were good, but not worth ruining good baking stone. Next time, I'll grease a sheet or perhaps even put them in a greased baking dish to make chocolate puddle brownies or cookie bars?! And, pay attention to how long they're in there: they're SUPPOSED to crack at the top, but still have changed from a dark color to lighter. 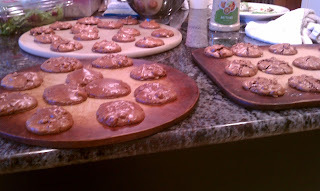 Also, the recipe I found called for just walnuts. To be quite honest, we barely had any walnuts, so I threw some white chocolate chips in there and called it a day (but of course I checked to make sure they were gluten-free). So I challenge anyone who uses this recipe to find something cool to put in it! It really was just a puddle of chocolate! They break easily, but don't let that stop you. 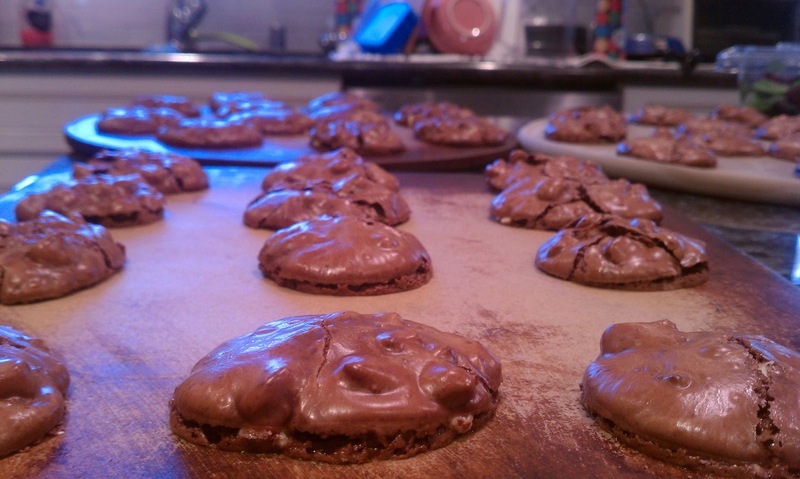 They're cookies like you've never had before, SO GOOD and so worth the amount of powdered sugar you'll need. One of the funniest things about these was when I took them to another friend and they ate them all right up...before I told them they were a form of 'healthy'. It was too funny. Preheat oven to 320 and line (3 is best) baking sheets with parchment paper. Sift together the sugar, cocoa powder, and sea salt. Stir in toppings, then add egg whites and vanilla until well combined. 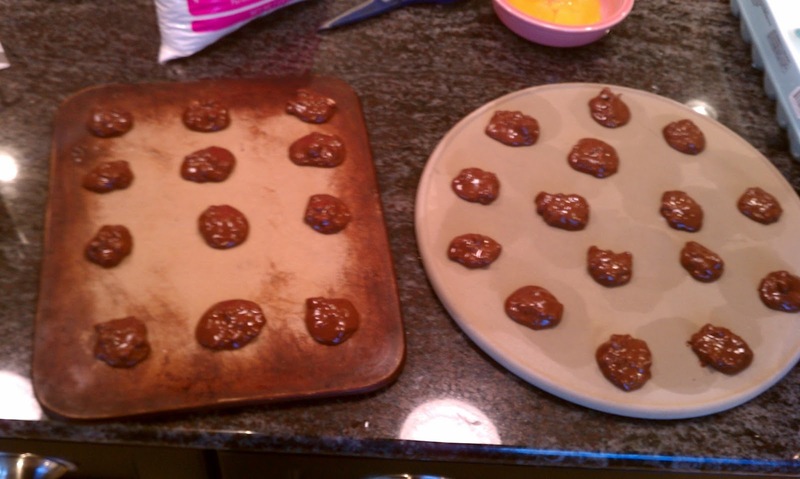 Put cookie dough (2 tbsp.) on sheets. It'll be more like batter than dough, and everything will spread out, so leave plenty of room for them to bake. 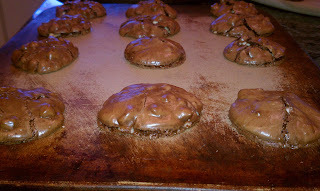 Bake until they get bigger and change from a dark brown to a lighter brown; they'll crack on top as well. This is about 12-15 minutes. Let cool and store. Enjoy! so funny we both posted a GF cookie. :) I don't follow a GF diet, but am mindful of how much I eat. I would gobble these right up. Easy solution. Parchment paper! Bake on parchment, and you won't have this problem at all. My daughter needs gluten free, so I will try this! Hey Nancy, thanks for the idea, I'll definitely have to try this! Also, I recently heard of a modified recipe of this using marshmallows on top! Good luck!